One such study published in the Cochrane Database of Systematic Reviews, using data from more than 600,000 women between the ages of 39 and 74 who underwent the procedure on a routine basis, found that many women were misdiagnosed and many of the same women also needlessly underwent chemotherapy. If you assume screening reduces breast cancer mortality by 15% and that over diagnosis and overtreatment is at 30%, that means for every 2,000 women who were screened over a ten year period, one of those women would avoid dying of breast cancer but 10 healthy women, who would not have been diagnosed if there had not been a screening, will be treated unnecessarily. The researchers concluded that mammography not only causes more harm than good but is a scourge that belongs in the history books of failed medical treatments, and not at the forefront of women’s medicine. One year after this review a second study out of Switzerland, published in The New England Journal of Medicine (NEJM), came to a similar conclusion. A team of medical professionals that included a medical ethicist, a clinical epidemiologist, a pharmacologist, an oncologic surgeon, a nurse scientist, a lawyer and a health economist, decided that the medical industry’s claims about the benefits of mammography are essentially bunk. A Canadian National Breast Screening Study, concluded with the others that mammography screenings do not reduce mortality rates from breast cancer any better than a simple physical examination. In other words, the procedure is completely unnecessary, and in many cases exceptionally harmful. The Canadian study’s authors suggest that careful physical breast examination may be a viable alternative to screening mammography in women aged over 50 who find mammography painful, unaffordable, or inaccessible or who fear the cumulative effects of radiation to the breast. A large-scale Swedish study found that 726 women of 60,000 who underwent mammograms were referred to oncologists for treatment even though about 70% were actually cancer free. The proportion of false positive results was particularly high in women under 50 years old. A whopping 86% of the women under 50 who were referred for further treatment wound up being found to be cancer-free. Another analyses done by the Nordic Cochrane Center involving 800,000 women found no statistically significant reduction in breast cancer mortality in the first nine years of a mammogram screening program. Thermography is a non-invasive technology that does not use radiation or compression to screen for breast cancer. Breast density also does not affect its results, meaning it’s accurate in younger women, too. It’s painless, easy to perform, can be performed in pregnant women, lower in cost than mammograms and can be just as effective and accurate (if not more). It measures infrared heat from your body and interprets the information in images that can tracked over time to look for changes. Using thermography, doctors can detect cancerous tumors in its early stages, offering patients the best chance of recovery. 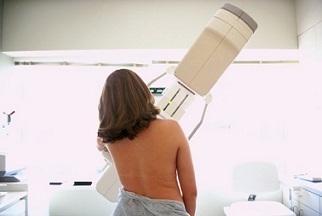 So if Thermography is better than mammography, why don’t doctors use it? Follow the money! Your immune system is your greatest weapon against breast cancer. Research now shows that 30% of breast tumors go away on their own, because a healthy immune system is so adept at eradicating cancer. Eat a healthy diet with cancer-fighting foods, get enough exercise, reduce stress and limit toxin exposure to lower your risk as much as possible. “Hippocrates, the father of medicine, called experience “delusive.” He recognized that uncontrolled observations may lead to faulty conclusions. For centuries the flawed logic of observational data seemed to validate bloodletting, an unhelpful and often harmful therapy. But most who were bled eventually improved—no thanks to the bloodletting—an observation that led medical authorities to believe in the practice.” David H. Newman, M.D.